A roundup of our favourite things happening this season. From velvet crush to holographic stationery, these are the trends you need to know this season. Discover the world of Kelly NG and her couture creations. The glowing sunsets, fragrant gardens, and golden bees of Côte d’Azur inspire this vintage bridal daydream. Styled, shoppable outﬁts for all of your upcoming bridal events, paired with the hottest hotels and venues of the moment. Beauty Edit——————33 Discover our must-have beauty products for spring. More Great Content B R I DA L FAS H I O N 82 The latest fashion-forward wedding dresses from in-demand international designers. S I G N AT U R E S E N D O F F 102 Get inspired by the periwinkle hue of goop’s new brick and mortar retail location! 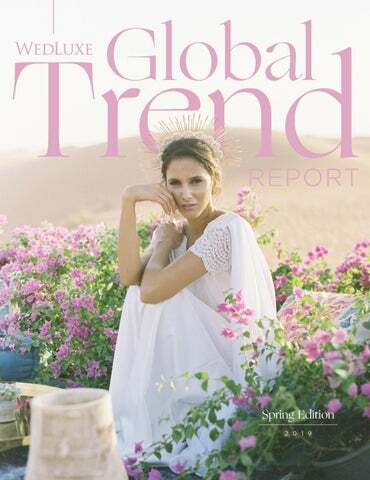 ultimate backdrop for this Bedouin bride on page 58. W E L C O M E TO THE SPRING ISSUE! I N B LO O M Louis Vuitton’s latest collab is with Japanese artist Tokujin Yoshioka, who worked with the French fashion house to design the Blossom Stool. This striking piece with a seat comprising four golden petals is a nod to the brand’s iconic monogram dating back to the nineteenth century. Spring is my favourite season. Always synonymous with growth and promise, but better still, the time of year when fresh new collections spring forward. Cue pretty colour palettes, ditching winter coats, and enjoying more daylight hours! I’m also excited about some of the many design trends that we see emerging. Starting on page 8, we’ve reimagined our mood boards to highlight colours and concepts that we see “springing ahead” in leaps and bounds. Personally, I’m crushing on the futuristic-meets-pastel shimmers of holographic materials, whether in fabric or paper. studded clogs, and silk shirts. housed inside a chic lucite travel case. F L O R A L S , S H E E R FA B R I C S , A N D M O D E R N G O L D D E TA I L S .
fluffy flower heads are the definition of boho chic. C E L E ST I A L- I N S P I R E D ACC E N TS A N D R I C H J E W E L TO N E S .
From sapphire sofas to cobalt ottomans, modern velvet upholstery sees a major resurgence. I R I D E S C E N T PA S T E L H U E S A N D P L E N T Y O F S H I M M E R .
through holographic foil stationery and packaging. installations are taking the design world by storm. S H A D E S O F L I L AC . Modelled after Jacobean Crewel Embroidery, its popular motifs feature the Tree of Life and stylized forests, usually rendered as exotic plants arising from a landscape or terra firma with birds, stags, squirrels, and other familiar animals. 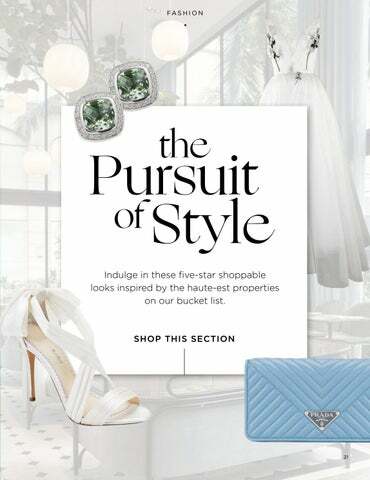 Pursuit of Style Indulge in these five-star shoppable looks inspired by the haute-est properties on our bucket list. A roundup of must-have beauty products. Kelly NG Known around the world for her couture creations, Kelly NG spoke exclusively with WedLuxe about how she got started in the industry, her signature design style, and the most elaborate gown in her latest collection. T H E FA S H I O N I N D U S T R Y ? C R E AT I N G A C U S TO M - M A D E G O W N ? After graduating as a top student in Fashion Design at Bunka Fashion Graduate University, one of the top five fashion schools in the world, I moved to Toronto to launch my fashion brand. I created my namesake couture brand and opened my showroom in downtown Toronto in December 2017. In less than a year, Kelly NG has garnered attention for dressing Oprah Winfrey and collaborating with London’s Damiani and the House of Garrard. Kelly NG is also the first Canadian designer to be featured on the cover of O, The Oprah Magazine, in the December 2018 issue (the biggest issue of the year). We’ve also been featured in Harper’s Bazaar, Vogue Singapore, Tatler UK, and more. Kelly NG gowns are designed and tailored specifically for a customer’s style, measurements, and silhouette. After the design and fabric choices are confirmed, the Kelly NG team will take a customer’s measurements and draft patterns. Patterns will be adjusted multiple times until it’s perfect. All of our gowns are constructed by hand at our Toronto atelier/showroom. They are made from expensive, high-end fabric and constructed with extreme attention to detail, finished by the most capable sewer. It usually takes between 100 and 800 hours (sometimes even more) to make a gown and the process typically requires three fittings. T E L L U S A L I T T L E B I T A B O U T YO U R S I G N AT U R E D E S I G N S T Y L E .
Kelly NG, the essence of sophisticated glamour, is revered for producing designs that are at-once feminine, contemporary, and perfectly unique. The haute couture brand is committed to innovation and the values of savoir-faire. With design and craftsmanship at its heart, each creation is skillfully designed and directional, combining art and technology to produce the most extraordinary of pieces. F R O M W H E R E D O YO U D R AW YO U R I N S P I R AT I O N W H E N D E S I G N I N G A N E W COLLECTION? Everything can inspire me; most of the time it just happens. It can be a scene that summons strong feelings, it can be a piece of art, architecture, a movie, a muse… everything and anything. Take my 2018-19 Autumn/ Winter collection as an example, the collection is inspired by a scenic starry night in Maui, where I spent a brief winter vacation. As the sun went down, darkness slowly enveloped the landscape. When I looked up at the sky, it was full of bright flickering stars, where one could see thousands of pinpricks of light. It was dark, peaceful, and quiet; everything seemed to be infinitesimal. D O YO U A C C O M M O D AT E C U S TO M I Z AT I O N R E Q U E S T S F R O M YO U R B R I D E S ? Yes, everything can be designed from scratch. It’s couture after all! W H E N I T C O M E S TO B R I D E S , W H AT SHOULD THEY KEEP IN MIND WHEN C H O OS I N G A W E D D I N G G OW N ? Do research before visiting a showroom or bridal boutique to make sure they have what you are after. Limit your accompanying crowd to just one or two, or even better, go alone for a stress-free environment. It’s good to to be up-to-date with the latest trends, but it’s always best to choose something that you feel represents you as a person and reflects your individual style, as it is such individuality that makes you special. Choose a design that is true to you because it’s your big day. H O W D O YO U C E L E B R AT E T H E R E L E A S E OF A NEW COLLECTION? The Kelly NG team is fully dedicated to haute couture. We always think about what to do next. D O YO U H AV E A FAV O U R I T E G O W N F R O M YO U R L AT E S T C O L L E C T I O N ? They are all my favourites, it’s hard to choose just one. Our draped gown, which elegantly wraps around the contours of the body, is one of my all-time favourites. Kelly NG possesses draping skills that other haute couture brands don’t have, due to its time-consuming, hand-executed nature. Some of our draped gowns can be constructed from up to 50 pieces, while mass-produced draped gowns can be constructed from as few as two pieces and international haute couture brands can construct draped gowns from around ten pieces. W H AT WA S T H E M O S T E L A B O R AT E G O W N YO U E V E R D E S I G N E D ? All Kelly NG gowns are elaborate and require different kinds of couture techniques. For example, the handpainted floral gown with a plunging neckline in my latest collection features a scene of blooming hydrangeas and flying hummingbirds, as if they are celebrating the beauty of spring. This hand-painted floral gown looks simple and easy to produce, yet the hand painting part alone took 560 hours to finish. This cannot be done by textile printing due to its limitations. For example, all printing devices are limited as to how many colours they can reproduce. Besides that, this gown is constructed from four pieces, and the floral scenery on each piece is different yet they all must connect to each other. When two pieces are sewn together, every single flower petal, every single stroke, is connected perfectly on the seam from one piece to another… this cannot be done by mass production. W H AT I S YO U R FAV O U R I T E FA S H I O N T R E N D AT T H E M O M E N T ? Colour tailoring. This is the season of Starburst suiting that runs the gamut in terms of colour and cut. Coats and jackets are coming out in bold, bright shades, and so are haute couture gowns. W H AT D O YO U S E E C O M I N G I N T E R M S O F B R I D A L FA S H I O N T R E N D S F O R 2 0 1 9 ? Pants and jumpsuits, geometric lines, bows, glitter. Bridal fashion trends are always different from fashion trends as they are different industries, just like prêt-à-porter (ready-to-wear) is different from haute couture, although they are both in the fashion industry. Despite new trends, I believe most brides will stick to the colour white and choose either a classic lace gown or a modern and simple satin gown. W H AT I S YO U R FAV O U R I T E PA R T A B O U T W O R K I N G I N T H E FA S H I O N I N D U S T R Y ? Thinking about what’s new, what’s next, and what can be done better is my favourite part of working in the couture industry. C A N YO U T E L L U S O N E T H I N G A B O U T K E L LY N G T H AT P E O P L E M AY N OT K N O W ? American cable networks HBO and PBS filmed a documentary on Kelly NG in New York City, which will be released in 2019. Windswept dunes and terracotta tones provide the ultimate backdrop for this Bedouin bride. Pout Clinic WedLuxe talks exclusively with Megan Kozak of The Pout Clinic about the benefits of facial enhancements, her signature application method, and the best injectable treatments for brides. T H A N K YO U F O R S P E A K I N G W I T H U S ! F I R S T O F F, C A N YO U T E L L U S A B I T A B O U T YO U A N D YO U R C O M PA N Y ? poor facework before and this is the biggest consumer fear. Therefore, it was an easy decision to go against the grain and build a specialty practice. I knew the type of place I would want to go to if I were the consumer so I built this company for consumers who are me. The face is a personâ&#x20AC;&#x2122;s most precious asset and for me, I would want to see a specialist. When I asked myself what makes a specialist, Malcolm Gladwellâ&#x20AC;&#x2122;s 10,000 hour rule always came to mind. This solidified the decision to only offer injectables and create an environment where practitioners could truly master the injectable craft. W H AT D O YO U L O V E M O S T A B O U T YO U R J O B ? There are two things I love most about my job; the first is educating. I always tell patients that 90% of my job is simply talking, whether it’s educating my patients or educating my team. (I drink about five bottles of water while working simply because I talk so much.) I get to debunk myths and teach patients about the aging process so they can better understand my approach and recommendations. The second is finding original “before” photos of patients after we have completed a full-face treatment. I have a rule that when I start a full-face procedure (which can sometimes take months to complete due to complexity and budget), the “before” photos stay in the vault until the entire masterpiece is complete. When the patient comes for their final check-up, we open the vault and spend about ten minutes laughing/screaming/ crying in awe of the gorgeous transformation. It truly is the best feeling. H O W A N D W H E N D I D YO U G E T S TA R T E D I N THE INDUSTRY? I entered the beauty industry at the age of 19 as a model. Everything in that phase of my life was all about the aesthetic. I found myself lost in the intricacies of that world, something far from what real life was supposed to be, but real enough to train my eye to be highly sensitive to all of the details. When that chapter came to a close, I found myself getting my nursing degree and always knew I would mesh the science nerd with the fashion model to build a career that I was truly passionate about. My injecting career began in 2013 at the age of 27 and since then I have never looked back. My type A personality is perfect for this career and my passion for the industry in general sets my drive to a different level. I like to push the boundaries all in an effort to discover what truly is possible with these procedures so I can share my knowledge with others. W H AT D O E S T H E P O U T C L I N I C P R I D E ITSELF ON? The Pout Clinic prides itself on results-based procedures. There is no such thing as “I just want one syringe” or “just give me ten units” because we will simply tell you exactly how much or how little you need to accomplish a perfect result. “But can we compromise?” Absolutely not. To compromise on a result is to compromise on our standard of work, which is completely against what we stand for. My famous saying that patients quote me on is, “I don’t decide what your face needs because your face tells me exactly what you need.” Some may call it harsh, but I call it reality. C A N YO U T E L L U S A L I T T L E B I T A B O U T YO U R T E A M O F P R A C T I T I O N E R S ? As a control freak of all sorts, building my team was a challenge. With an inbox full of resumĂŠs, it was a grueling process to find the right fit, but the universe came through. The most important thing to me when adding practitioners is to identify their desire to learn and their drive to be the best. If they have these qualities, then they are the perfect fit for The Pout Clinic. My team works under my direction and follows my signature methods for all procedures. C A N YO U T E L L U S A B I T A B O U T YO U R S I G N AT U R E M E T H O D O F A P P L I C AT I O N A N D H O W YO U C A M E TO D E V E L O P I T ? My brain works equally in terms of logic and creativity so it was only natural for my art to become systematic. My meticulous habits are responsible for creating my method and my hands are responsible for getting it on paper. This was necessary in order to build my team and maintain my standard of results. The reality is that it takes years to build experts and with a busy clinic waiting years to develop experts is not an option. Think of the method in terms of the ideal assessment tool; my set of eyes guiding the practitioner to see what I see in the face. When we have someone guiding us, our eye becomes trained much faster than trying to spot the details on your own. Step by step, from top to bottom, analyzing each area of the face on each individual; this is how we get the perfect result. W H AT I S YO U R P R O C E S S W H E N S O M E O N E B O O K S A C O N S U LTAT I O N ? I would like to say that when a patient comes in for a consultation, I listen to their concerns and do my best to address them, but to be honest I stopped listening a long time ago. I think this is the reason patients come to The Pout Clinic now, simply because we are known for seeing the bigger picture. Patients get extremely hyper-focused on individualized areas and completely forget that the face does not age in one area, it ages globally. Therefore, we must take a global approach to get the	optimal outcome. T R E AT M E N T P L A N S ? The treatment plans are a collaboration between patient and practitioner; identifying all areas, the order in which they need to be completed, and a timeline of when the patient would like to accomplish everything. I try to explain that this is not injection, itâ&#x20AC;&#x2122;s architecture. Anyone can push a plunger with product in it, but not everyone can build a face plan and then execute accordingly. Some plans have taken me as long as eleven months to finish and others I have finished in three hours. (Yes, you read that rightâ&#x20AC;Ś three hours injecting one person with 23 syringes.) Each person has their magic number and of course it varies with the complexity of the case. My goal is to teach patients to do the appropriate treatments prior to hitting their expiry date so their number never becomes 23 in the first place. B I G D AY ? Bride or not, step one is always Botox. I say this because we could do the most beautiful filler treatment on anyone, but if there is noise in the background (meaning wrinkles on the forehead or around the eyes), it is simply a distraction and the refreshed appearance of the filler work will fade into the abyss. Step two would be to brighten the eyes with a complete midface correction using filler to create a frame around the eye and remove the tired appearance of the eye. Step three would either be a subtle lip enhancement OR profile balancing (which could include nose refinement, chin enhancement, and/ or jaw contouring), as brides want to look amazing from all angles. H O W FA R I N A D VA N C E O F H E R W E D D I N G D AY S H O U L D A B R I D E B O O K A N A P P O I N T M E N T F O R A B OTOX O R F I L L E R T R E AT M E N T ? If the bride is a procedure virgin, I would recommend starting the process a year in advance. This gives you time to check out different providers, hear their recommendations, and find the practitioner that you truly mesh with. It also gives you time to get your feet wet with procedures (sometimes it’s nice to sample before jumping right in). Botox takes two weeks to take full effect and lasts three to four months, therefore I recommend coming six weeks prior to the wedding date as my personal favourite sweet spot is the six week mark. For filler, I suggest three to six months in advance as some plans require time to achieve the optimal result. W H AT A R E S O M E O F YO U R M O S T P O P U L A R T R E AT M E N T S ? Our popular treatments have definitely shifted over the years. We were originally known for our signature “pout” of course, but the past year has been all about the midface correction with under eye treatment and the full face overhaul. Kylie Jenner spawned the lip injection trend, but the trend now is really moving towards looking like yourself, just better. W H AT A R E T H E M A I N B E N E F I T S O F B OTO X ? Botox is simply magic in a vial if administered correctly. The benefits of Botox include softened wrinkles in the frown, forehead, and crow’s feet, plus I can’t forget to mention the preventive measures of the magic drug. There is nothing better than a line that never forms in the first place. For real though, if you haven’t tried Botox, you truly are missing out on feeling like a superhuman. W O R K I N G O N A N D W H AT â&#x20AC;&#x2122; S N E X T ? FILLERS IN THE LAST FEW YEARS? What I can tell you is that we are working on something exciting, however, the details are top secret. This next chapter is all about sharing the knowledge I have gained in my career and pushing the limits of what it means to welcome the future of beauty. I am extremely passionate about this next chapter as I know I have more to give to the industry beyond the art of injection. Two words. The Kardashians. A N T I - A G I N G A N D R E J U V E N AT I O N T R E AT M E N T S A R E B E C O M I N G I N C R E A S I N G LY P O P U L A R A M O N G M E N . W H AT T R E AT M E N T S D O E S T H E P O U T C L I N I C H AV E AVA I L A B L E FOR MEN? Men are seeking the same outcomes as women actually. They too want to look like themselves, just better. Men will come in for their Botox treatments, however, with men I usually say twice a year is good instead of three to four times a year, which is what most women do. Men are able to do less treatments because too much Botox over time will create a more feminine look due to muscle atrophy. When it comes to filler, we are doing very similar midface/ under eye corrections, as well as jaw contouring and chin enhancement to create more masculine features. I S T H E R E A N Y T H I N G E L S E YO U W O U L D L I K E O U R R E A D E R S TO K N O W A B O U T T H E POUT CLINIC? As I mentioned above, we are working on a top secret project and because of this, my time is limited. This is the reason I started building my team of practitioners; so they can take care of the masses while I am building the next chapter. To all of our existing patients, thank you for trusting The Pout Clinic with your most precious asset. And to all of your readers, we hope to see you soon. goop recently opened its third brick and mortar retail location at the Rosewood Miramar Beach Hotel in Montecito, California. Dubbed “goop Sundries,” the shop was designed by Kate McCollough and Max Zinser of KMZ New York and is stocked with miscellaneous luxury goods, not to mention the on-trend periwinkle hue chosen by Paltrow herself! ©2006-2019 Cloud Nine Creative Inc. All rights reserved. 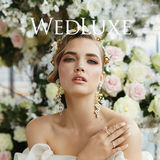 WedLuxe Magazine does not guarantee or endorse the quality of services or products of our advertisers or featured suppliers. 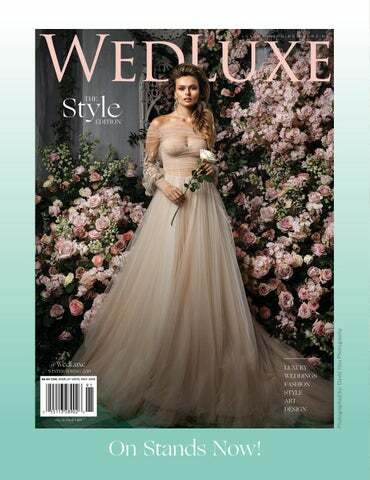 “WedLuxe Magazine—True Love. True Luxury” and its logotype are registered trademarks of Cloud Nine Creative Inc. WedLuxe Inc. All rights reserved WedLuxe Inc. All rights reserved.